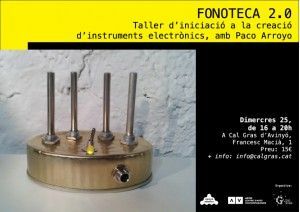 FONOTECA 2.0 (Sound Library 2.0) is a project by Paco Arroyo within the residencies programme Campo Adentro and with the collaboration of Cal Gras Alberg de Cultura and ACVIC. Centre d’Arts Contemporànies. The 2.0 sound library project links musical tradition with the many possibilities for musical reproduction which technology has to offer. Tradition and modernity, the creation of new musical instruments and the modification of traditional instruments, these concepts reflect perfectly the hybrid territories of today's rural areas, involved in processes of transformation and convergence between nature and technology. 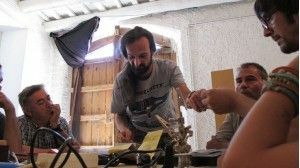 After an initial phase of investigation and recording of traditional music in the valley of the Gavarresa, Paco Arroyo is working on a reinterpretation of this music using modified traditional musical instruments and others built in-situ with recycled materials taken from the environment. 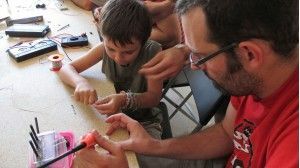 To realise this project, Paco Arroyo is currently living in Avinyó, collaborating with groups linked to the region's musical tradition and with contemporary electronic music groups, as well as experts in the region's musical tradition such as Segimon Coromines (lutist), Ramón Vilar (musicologist) or Jordi “Llaunes”, percussionist of the Colla de Grallers. 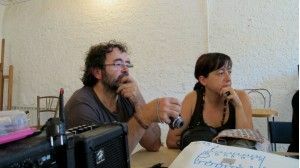 Also participating in the work are the Grup de Cantaires and sound collective Autonoise. A concert and a workshop to be realised in Avinyo are activites attached to this project. 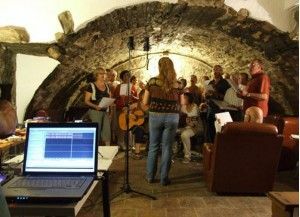 On the 20th of July, a concert took place in Avinyo, where the Colla de Grallers, Autonoise and the Grup de Cantaires performed their traditional repertoire with an electronic base. 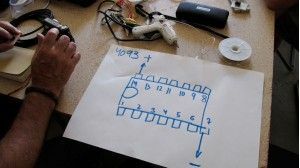 On the 25th of July at Cal Gras, Paco Arroyo offered an introductory workshop in building oscillators through the Polkador, a mini- synthesiser for accompanying polkas, paso dobles and other tradicional dances based on binary systems. 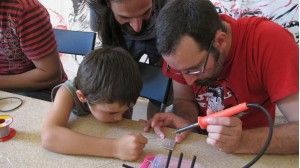 Paco Arroyo (València, 1977) is a versatile artist within the performing arts, a self-taught musician, actor, composer and luthier. Complementary to his artistic career, he also works as a sound designer in films and TV. He has composed soundtracks for short films, television and video games. He has also participated in several bands such as “Orbe Contrario” or “Lüa”. He is currently taking part in "Bajito Humo", a radio project which over three years has been exploring the boundaries between sound art and experimental music through musical improvisation and everyday poetry. As a songwriter, under the soubriquet of “el Jipi del Arroyo”, he released the album "De Leds". 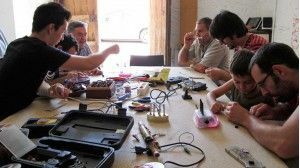 As a luthier, his most notable work is the "electronic lute," a violin with a tin body, including electrical components from a mobile phone. 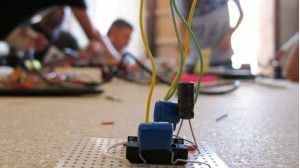 He also modifies electronic sound devices to extract their musical component. All Paco Arroyo's sound creations may be found in his blog, hosted on the site of Campo Adentro. The project Campo Adentro - Arte, Agriculturas y Medio Rural (Art, agricultures and Rural Affairs), which started in 2010 and which will continue under development until 2013, serves as a meeting place for farmers, intellectuals, rural development agents, administrators, curators, artists and art critics, with the objective of opening up a space for reflection upon the rural environment through contemporary art. ACVic. Centre d’Arts Contemporànies is a public centre promoting creation, production, exhibition and distribution of contemporary art. As an arts centre focusing upon the relationship between art, education and social space, ACVic is committed to its immediate environment, while at the same time seeking dialogue with the national and international context. It encourages networking and the development of projects through partnership, collaboration and co participation. Cal Gras is a cultural hostel in Avinyó offering residencies for artists and working as a production centre and as a space for creation.